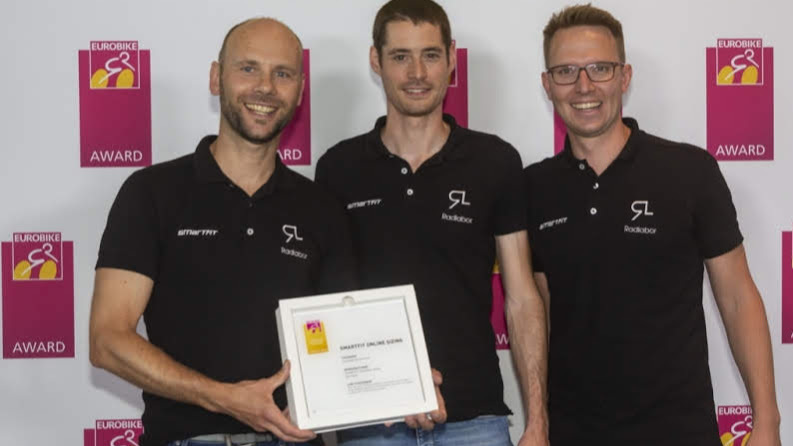 At this year’s EUROBIKE, Radlabor GmbH has been awarded a coveted EUROBIKE Gold Award (in the category “Concepts & Services”) for its exceptionally innovative approach of its SMARTFIT Online SIZING tool. The tool providespersonalized sales advice for buying bikes online, helping customers by means of precise size recommendations to find the right frame size both quickly and easily. This strengthens customer confidence in online purchasing and makes costly returns a thing of the past. Digitalization has radically transformed the bicycle retail landscape and presents both manufacturers and bike retailers with completely new challenges. For some years now, the presence of online shops alongside traditional distribution channels has been increasing, and while this format rarely provides much advice, the online shops do score points with their huge selections, low prices, and short lead times. As a result, an increasing number of shops and businesses are trying to sell their bikes through their own or third-party online portals using a multichannel link to their sales outlets. However, it is hard to compare online shopping with the classic purchase in a bike store, as buying a suitable bike generally requires a certain amount of time and professional advice. Furthermore, online customers have previously been left unaided when it comes to the most critical of questions: What is the right size? This is because online shoppers must decide BEFORE making a purchase what size they should put in their shopping cart, just like when buying clothes, and it is quite common for the sizes to vary quite wildly depending on the brand. And if there is any hint of uncertainty at this point, interested customers tend to discontinue their purchases and, in the worst cases, leave the site. This is something that online providers have recognized too. This is why you can find more or less legible tables, graphs, or calculators on many manufacturers’ webpages, online shop FAQs, or external links; however, these are usually neither user-friendly nor provide a satisfactory result. They are far more comparable with a simple navigation solution, where a map is available as a PDF to be printed. And who today does not prefer to use Google Maps or a modern navigation system? Smartfit bike-fitting systems help to sell bikes and provide a service. Our measurement tool is scientifically sound and easy to operate. Our fitting software and geometric data are backed up by an online database and automatically updated. Smartfit is the bike-fitting brand of Radlabor GmbH. We first started out at the Freiburg-Schwarzwald Olympic Centre and the Institute of Sport at the University of Freiburg. Smartfit combines scientific know-how with many years of practical experience gained from our own three service centres in Freiburg, Munich and Frankfurt. We have opened Mo. - Fr. from 9.00 am to 06.00 pm.